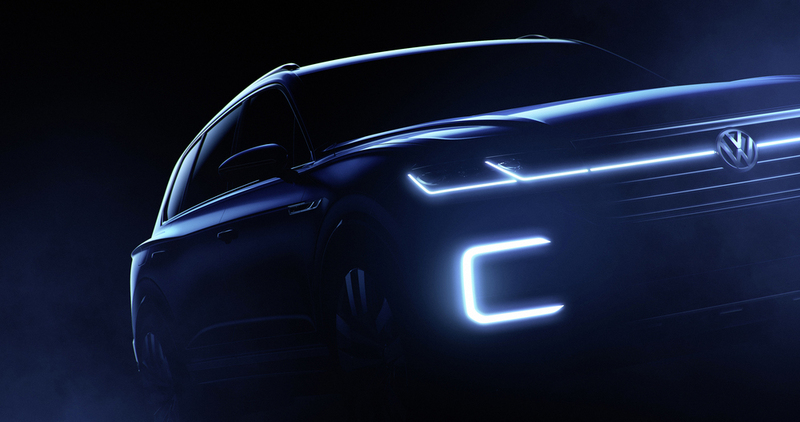 Volkswagen has shown renderings of its new Beijing Concept SUV. Described as ‘one of the most advanced luxury SUVs in the world’ VW isn’t giving too much away ahead of its Beijing debut, however it has confirmed the concept accelerates from 0 to 62 mph in 6.0 seconds and has a top speed of 139 mph. Volkswagen says the concept aims to move luxury SUV design to a more ‘sporty and elegant level’ with a lounge-style interior and digitised operation ‘centred on passengers’. The showcar will further demonstrates Volkswagen's continued ‘digitilisation of the automobile’ with a digital operation, including Active Info Display and an infotainment system merge as well as a display system 'enabling a new level of interactivity'. The car has a plug-in-hybrid powertrain with a total output of 376 horsepower and 516 pound-feet of torque. The SUV features a fully electric range of up to 31 miles, with predicted NEDC combined fuel consumption coming in at 78 mpg. Volkswagen will reveal the concept at the Beijing Auto Show which runs from April 25 to May 4.